Brand New 2 pcs 15-1/2 x 4Ft (186"L x 48"W)Pergola Canopy Replacement Cover! Perfect to Make Your Pergola Shiny and Refreshing! - Perfect protection and sun-proof! - More effectively for harmful UV blocking. - Half a year longer life time than other canopies without coating. - Thicker and more durable than other 160g/sqm or 180g/sqm polyester canopies. * By inserting a rod weight(not included in this listing) on each end for windy resist. **Metal structure in picture not included. 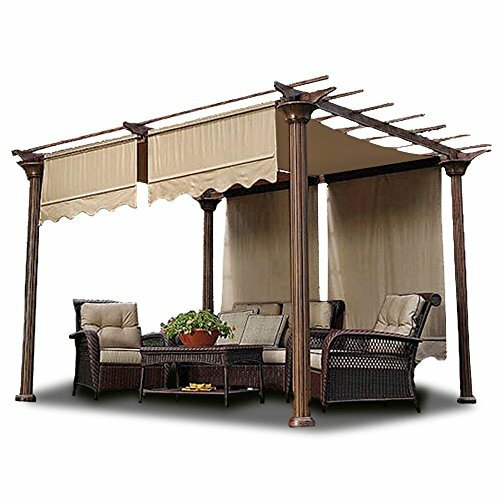 This product includes the fabric canopy only, without grommet.